Grand Central Life & Style, 9781455581887, 352pp. Could the toast you ate for breakfast bring on your afternoon headache? Could the milk in your coffee cause joint pain and brain fog? Could your healthy tofu stir-fry slow your metabolism? Yes-there is an age-old, powerful connection between what you eat and how you feel. Just as no two bodies are the same, no two diets work for everyone. The only way to discover your ideal diet is to follow an elimination diet that will help you link foods to symptoms and customize a diet that works for you. Phase 1: Detoxification--A 2-day liquid fast that includes broths, smoothies, and juices to calm the immune system and removes toxins from the body. Phase 2: Elimination--For 2 weeks, you will eliminate potentially inflammatory foods from your diet, which will ease symptoms quickly. Phase 3: Customization--For 2 months, you will test different foods to see what works for you and what doesn't, resulting in a tailored diet you can enjoy for life. Complete with over 100 delicious recipes, shopping lists, and meal plans, THE ELIMINATION DIET is a complete resource for you to improve your health and feel better, naturally. Alissa Segersten is a cooking instructor and author of the food blog, nourishingmeals.com. Tom Malterre, MS, CN, is a certified nutritionist. He coaches physicians and other health care practitioners on using Functional Medicine principals in their clinical practices, and travels the U.S. and Canada lecturing on the biochemical interactions within the body and their relationship to diet. "I'm a strong proponent of elimination diets, and The Elimination Diet makes it easier than ever to customize your diet for improved health and wellness." "I've seen time and time again how eating the wrong foods can cause weight gain and fatigue. 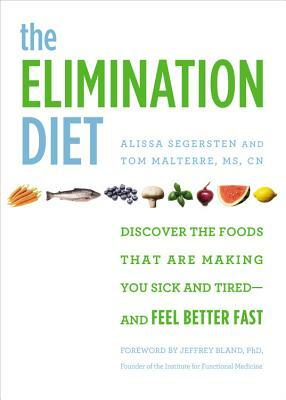 The Elimination Diet makes it easy to pinpoint what foods work best for you-this book is a life changer!" "The most well-explained and evidence-based elimination diet that I have seen. I would highly recommend the program outlined in The Elimination Diet for anyone struggling with unexplained symptoms of anxiety, chronic pain, or poor digestion."